A player of the Mega Fortune Dreams slot hit its middle level Major Jackpot and won an impressive €90,319. A player of Net Entertainment’s Mega Fortune Dreams slot has hit the middle level Major Jackpot and won €90,319. 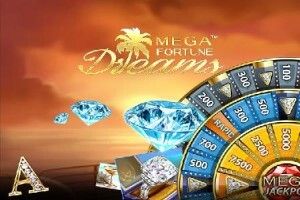 Mega Fortune Dreams is a 5 reel, 20 fixed payline slot built on the theme of luxuries that dreams are made of. In total it offers three progressive jackpots, the Rapid, Major and Mega. All three of the jackpots are won via the bonus game which is triggered by landing three bonus symbols anywhere on the reels. The bonus game consists of three wheels, the wheels are spun one by one and by spinning the right symbols on the first two players work their way towards the third. The third wheel can award the Rapid and Major jackpots or it can land on the symbol that takes players to the centre of the wheel to collect the Mega jackpot. On average the Major jackpot is won about once a week and pays out in the region of €80,000. The largest ever win actually came earlier this month when one player walked away with €166,500. At present the Mega jackpot is worth a staggering €1.16 million while the Major jackpot has already grown past €20,500.